Each of these elements is a tool to be used in the overall development of the tree and is used each year. Use of these techniques allows us to "guide" the energy of the tree in the correct proportion to the right areas. They are used in the proper formation of the branches in an ongoing program. Please note that these techniques should only be used on healthy, well-fed trees. Using them on weak specimens will be fruitless at best and fatal at worst. Also keep in mind that these techniques as described are not consistent with some specific elements of ramification (needle reduction, etc...), but should be regarded as general guidelines. As there are many specific technique details used in pine ramification, know that this is just a basic overview. Buds most often occur in clusters or whorls at the end of shoots. The general task is to select two of them to keep and remove the others. These two buds will form a forked shoot. forks are the most useful and aesthetically pleasing branch formation. Note that at the apex, you may need to leave three buds instead of two. In general, remove buds in early spring and/or late summer. If you have done ramification work this year, having removed the spring shoots in the early summer, and the tree has produced new buds, remove buds in late summer/early fall. If you waited until fall to remove shoots, the tree will not produce buds until the following spring - remove them then. position of the bud on the shoot (is it on the side or top or bottom?). Pines are apically dominant, so you will need to restrain the upper branches by eliminating the strong buds and keeping the weaker ones. Since a lot of energy is directed to the apex, it is common for the upper shoots to have 5 or more buds each. The lowest branches may only have 2 or 3 buds on a shoot. Since the lower branches often need more strength and volume, it may be wise to keep 3 buds rather than just 2 so that more energy is directed to the branch. The third shoot can be removed later when it has done its job. Another consideration in bud selection is the relative position of the bud to the trunk. Interior branches and buds are often weak since more energy is directed to the ends of branches. It is best to select stronger buds for the interior and weaker ones for the branch ends in order to balance the energy of the branch. In many cases, you may want to leave more buds than necessary in order to strengthen the interior branches. These considerations are most important for the lowest branches as they are larger and have more of the interior visible. If you are working on a lower branch that is weak and needs more volume, it may be wise to let the terminal bud (the one on the end) grow out unrestrained while you develop the interior shoots. 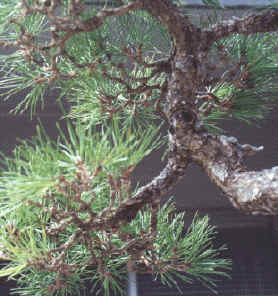 This technique will allow the branch to increase in size and strength and it can be trimmed back later when it has finished growing the size of the branch. This is known as a sacrifice branch (or in this case, a sacrifice shoot). Whenever possible, select buds that grow on the sides of the shoot rather than the top or bottom. This allows for proper formation of foliage pads and good branch structure. It may not always be possible to get a good bud on the side and one from the top or bottom must be selected. This is okay, but it is better when this occurs on the interior of the branch and is best when it is one of the lowest branches. 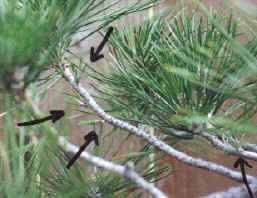 Candle pinching is another method for growth regulation on pines. By early or mid-spring, the buds will have lengthened into candles and, despite your careful selection last fall, will be of different lengths (strengths). At this time you will generally pinch back the longest candle to match the length of the shortest candle of the pair. Make sure neither of these candles is more than one inch long. Note that if you pinch back the candle before the needles break, the new buds will form at the base of the candle. If you pinch the candle after the needles have broken, the new buds will usually form at the end of the candle. Just as in bud selection, when pinching candles, consider the location of the candle as compared to the needs of the tree or the branch. For instance, at the apex you might want to pinch back a strong candle a bit more than if it were on a mid-level branch. Conversely, if the candle is on a lower branch that needs more energy, consider leaving the candle alone to grow until you trim shoots later in the year. Always keep in mind that the longer you leave the candle and the longer time you leave it alone, the more energy will be directed to the branch and the shoot. Always pinch candles off flat, never on an angle. Needle plucking is a great fine tuning tool for pine maintenance. Needles are pulled around November in zone 8 and the technique accomplished two things: one, it allows air and sunlight to penetrate the foliage to increase the health of the interior shoots, and two, it helps to further restrain the energy of the shoots where necessary. Both old and new needles may be plucked according to the needs of the tree. A basic rule is to leave fewer needle-pairs on the upper shoots, more on the lower shoots and on the mid-level shoots leave a median number. Like the other operations, you must also tend to leave more on the interior shoots and pluck more from the ends of branches. Often, no needles are plucked from the interior shoots. You must keep in mind both the strength of the shoots and the health of the tree when doing this operation. Some basic quantities are 3 or 4 pairs on the upper shoots, 5 or 6 pairs on the mid-level shoots and 8 to 12 pairs on the lowest shoots. These numbers are not absolute! The actual numbers for you to use depend on the needs and strength of the tree. A good technique for the improvement of budding for a young tree is to let the tree grow throughout the season unhindered. In September, cut off all of the current year's growth, leaving only last years needles (as long as they are healthy). This will cause the tree to burst forth with a multitude of new buds further back on the branches, some even on old wood, the following spring. Using this technique can greatly increase the density of the branches and improve a tree considerably. As with most techniques used on black pine, this one should only be used on healthy, well-fed trees.